As I was walking around the garden this week there were a few flowers that just struck me as ridiculously perfect. Notice the structural similarities of the first three which are all more or less lilies (this family is always changing). Gloriosa vine is reportedly hard to grow here in Seattle because of its tropical origins, but for me it has been well worth the effort. 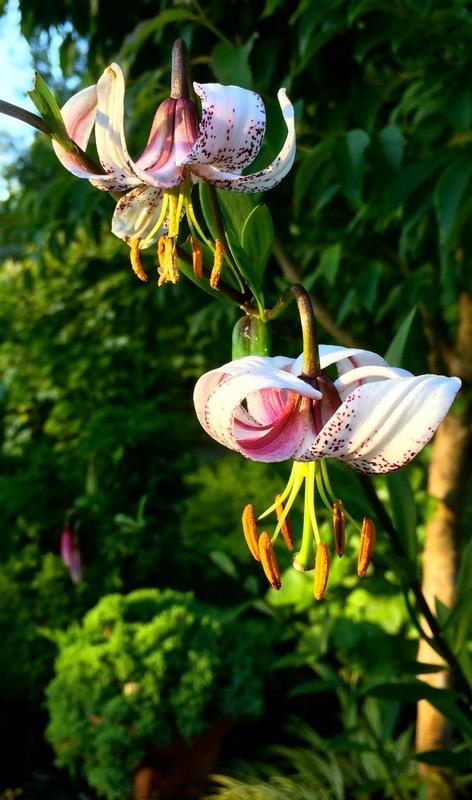 The flowers on this climbing lily are green when they open up, then slowly evolve to red and yellow before flattening out and becoming a deeper, richer red as the grand finale. They are long-lasting and take about two weeks to complete their entire display. I put some bromeliads & orchids from the clearance rack at Lowes in this hanging basket (No names unfortunately - I need to smack their garden supplier in the head and tell them "Assorted tropical foliage" is not good enough for me). They have literally been blooming all summer and are still going strong. Abutilon or flowering maple is not completely hardy but here's what I do to keep it alive: I buy one in the spring and plant it in the ground, let it grow and flower like crazy, then in September or October, I take cuttings (5 or 6 inches long from the growing tip) and stick them in a glass of water with a clear plastic bag loosely covering it to help retain moisture. They will be sprouting roots in no time, and then I can pot those up and place them next to a window for next year. If we're lucky and get a mild winter, the one in the ground will survive. 'Tiger Eye' is my favorite cultivar. Lobelia tupa is right in the middle of its almost endless stretch of flowering. 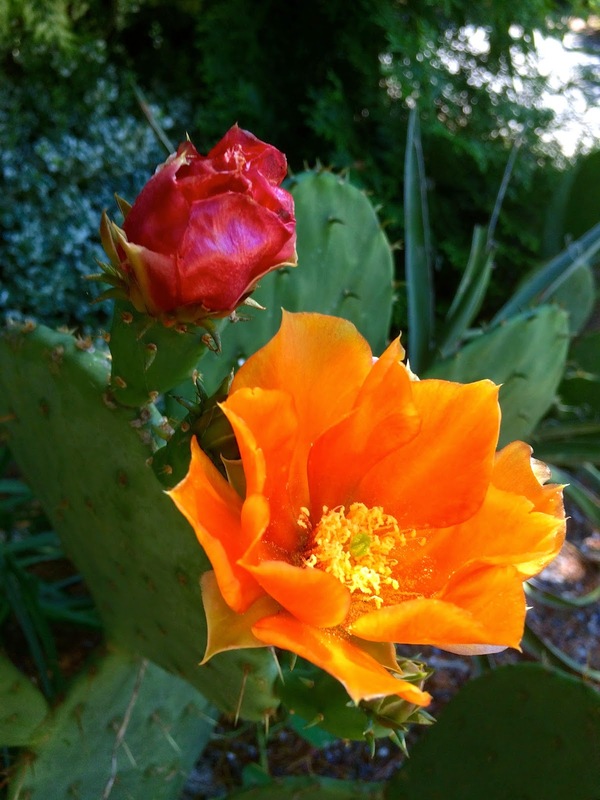 Another plant that slowly changes the color of its flower is this Opuntia which I'm 99% sure is Opuntia engelmannii. It starts out bright yellow, is orange by the next day, and then turns red on the third day. 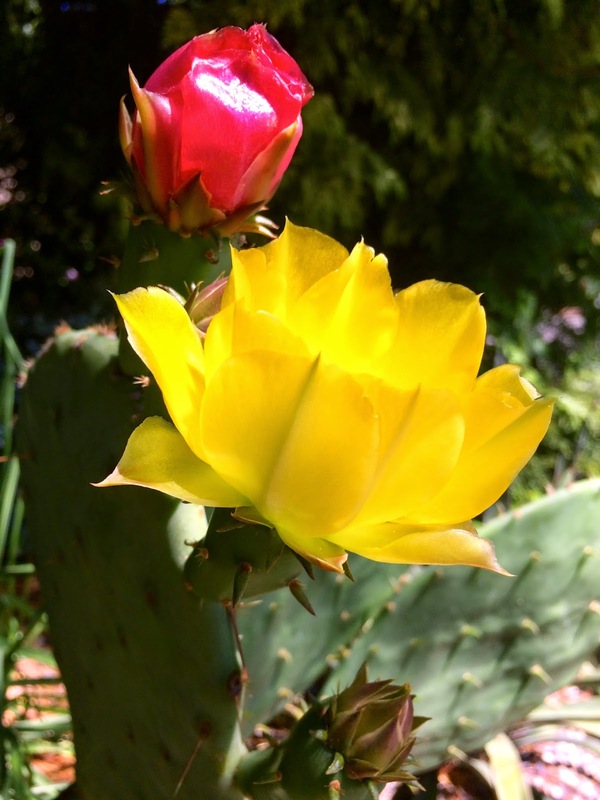 A flower that lasts for three days isn't bad for a cactus! 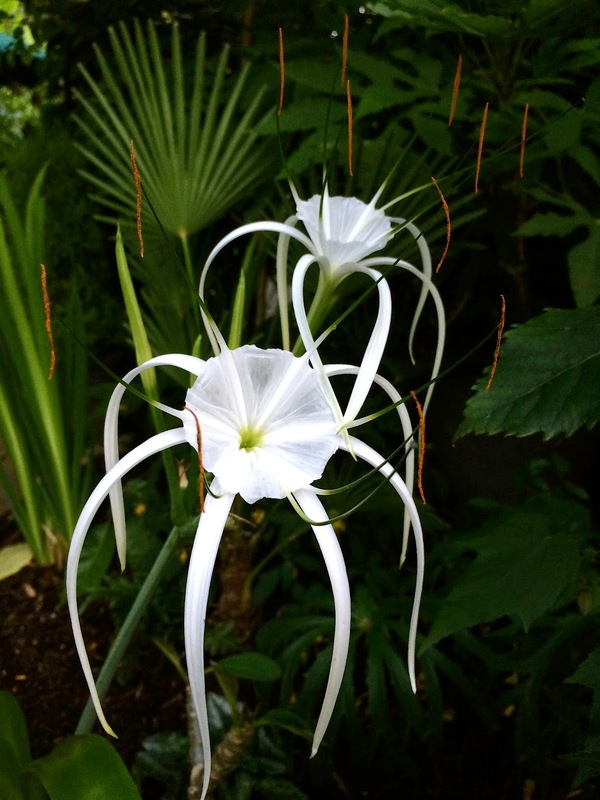 Great blooms all but the Tropical Giant Sister - wow! Yes it is very striking. Too bad they only last for 2-3 days at best!